The Stewart’s Black Spider is a famous fly, rough and simple in its original form. Consisting of only a hook, some thread, and a starling feather, this minimalist pattern has accounted for countless fish in a variety of waters. The story goes that W. C. Stewart adopted this fly from a talented Scottish fishing guide, James Baillie. Stewart described this pattern, and others, in his book The Practical Angler way back in 1857. His method of tying the spider was simple and scruffy. The Black Spider worked over 150 years ago and still works today. For my last four trips to local streams, I’ve fished the Stewart’s Black Spider exclusively, trying to learn all I could about it. It’s been an effective pattern, even in my in-experienced hands, and has taken dozens of fish. I think part of its attraction is that it lands softly on the water, yet looks amazingly life-like. One humorous incident illustrates its effectiveness. As sometimes happens, I lost a Black Spider in a tree and just couldn’t find it. Well, I went on fishing down the stream, and in about an hour returned to the same spot. I wasn’t thinking about the fly I lost, but there was a mulberry limb hanging near the water when I reached to handle a fish. My hand instinctively recoiled when it came close to what I thought was a spider. Well, guess what it was? That’s right . . . my Stewart’s Black Spider! At a passing glance, I was sure it was a real spider. A pattern like that just has to catch fish! There are several ways to tie the fly which are detailed in books or recorded on video. The hard part is working with the starling feathers because they’re fragile. I like to use black thread instead of Stewart’s original brown, and I prefer the method described by Dave Hughes in his book Wet Flies. A size 14, wide-gap hook works well. Just remember to use a delicate touch, and you’ll do fine with a little practice. The fish don’t care if the fly looks a little rough; in fact, they like it that way. 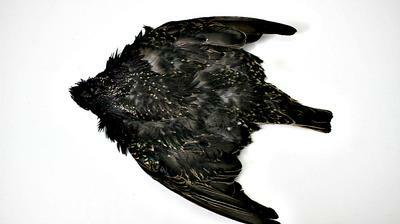 Part of the secret in tying a good Stewart’s Black Spider is simply to select the right starling feather. You don’t want the tiniest ones near the neck, nor do you want the stiff, coarse ones on the outer part of the wings. Find the soft “in-between sizes,” and the tying becomes easier. At least that’s my experience. How should you fish the Spider? I’ve had my best luck fishing cross stream or slightly upstream with just a few light twitches. I think the tendency is to over-work the fly. Let the hackle do most of the work. Again, a gentle cast . . . patient sink . . . light twitch. What a deal! A hook, some turns of black thread, and a scruffy, iridescent hackle waving in the water. Three words describe Stewart’s Black Spider: simple, yet effective. W.C. Stewart was on to something. It is always tough to decide on what attractor fly to fish! Now I have added Stewart's Black Spider to my list to try! My attractor fly of choice is the golden ribbed hair's ear nymph. I tie them weighted and unweighted. 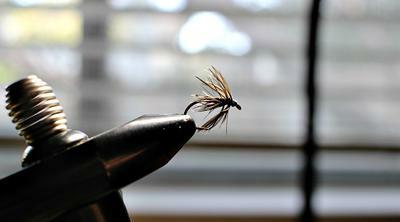 I continue to gravitate to Kebari flies however. To me, the Stewart's Black Spider is much like a Kebari. This year my commitment is to learn how to fish with Kebari. I have had a lot of success with the Keeper Kebari. I am going to consider the Stewart's Black Spider an English cousin, so I am going to tie some up for the box. Thanks John! Although you will not want to use the neck feathers for "normal" sized flies, they work great on tiny hooks for micro fishing! With midge jaws for your vise, 16/0 thread, a good light and a steady hand, you can tie them down to the size 30 Varivas hooks. You'll catch fish with them, too. It's that "light and steady hand" part that gets me in trouble! You're right--you don't want to discard any of the feathers, as they all have their applications. For those who are just starting out with the Stewart's Black Spider, or just beginning to tie flies, the starling feathers can be a little frustrating because they break easily. Like most things, patience and practice pay off. There's something cool about using a fly that's over 150 years old! John - Red Wigglers pre-date the Stewart's Black Spider! They are cool to use and catch fish! I'm going to be fishing with some of them tomorrow. If there are no bears hitting our bait, I am going to go over the mountain to a creek where I can fish my new Tenryu Furaibo TF39 Becchou. And "Yes Chris," I have two batteries charged for the camera! Bear hunting is a lot like fishing. Preparation, location, and stealth are needed. If there is no activity yet at the bait, there is no reason to sit in a tree all day! 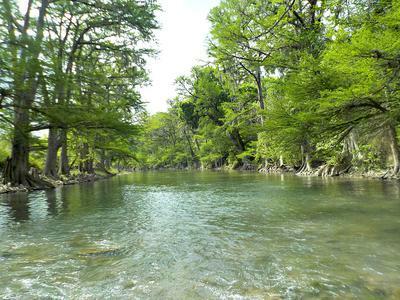 Especially when one of the better fishing creeks is only 12 miles away, and is big enough for a 4 meter rod. I'm also hoping to fish the small creek near where we hunt with the Tenkara Gen 240. I'm exited to go after some wild fish instead of planters. Or, you could use the Power Isome instead of red wigglers and have the bears come to you. Just keep your bow handy while your are fishing! One more thing, watch your back. I am putting together a set of flies that I call the Missouri Trout Park Specials. The Stewart Black Spider in size 20 will definitely be in it! I have found that it works very well when the trout are rising to something in the film. It's small, buggy, and could be taken as just about anything. This fly in 14 or 16 with a small tungsten bead is always in my box. Trout like it and I've found it to be excellent for panfish, especially in the early spring when the ponds are just waking up. I love weighted flies. 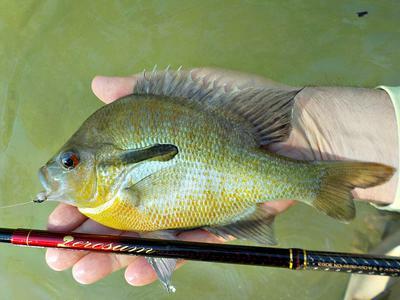 Weight plus a fixed line puts you in control of the whole water column.